Because enlarging the very tight two-car garage was also part of the scope of work, we were able to take over one of the two existing garage stalls to make a mudroom and a home office (shaded in the image above). One nice feature of this location was that the new office could be accessed directly from the main entry to the home, thus maintaining the privacy of the home itself. 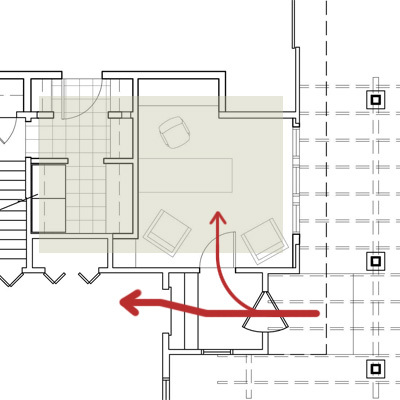 The existing entry was two steps lower than the level of house, and we decided to raise the garage floor only to the level of the entry, thus keeping it lower than the house proper, another physical cue of separation between work life and home life. Raising the garage floor slightly allowed for insulation to be put in under the floor so the office could be a pleasant place to work in year round. The new garage stall that we added to replace the one we took over was both wider than this stall, as well as having room to make it double deep since it runs alongside the existing house instead of in front of it.